The presidents of Technische Universität Darmstadt, Johannes Gutenberg University Mainz, and Goethe University Frankfurt have signed a framework agreement intended to promote further collaboration between the three universities. This strategic alliance of the Rhine-Main Universities with a total of about 107,400 students, 1,440 professors, and more than 70 cooperation projects is aimed at expanding and permanently securing existing collaborations in research, teaching, academic continuing education, and the promotion and mentoring of young research talents. 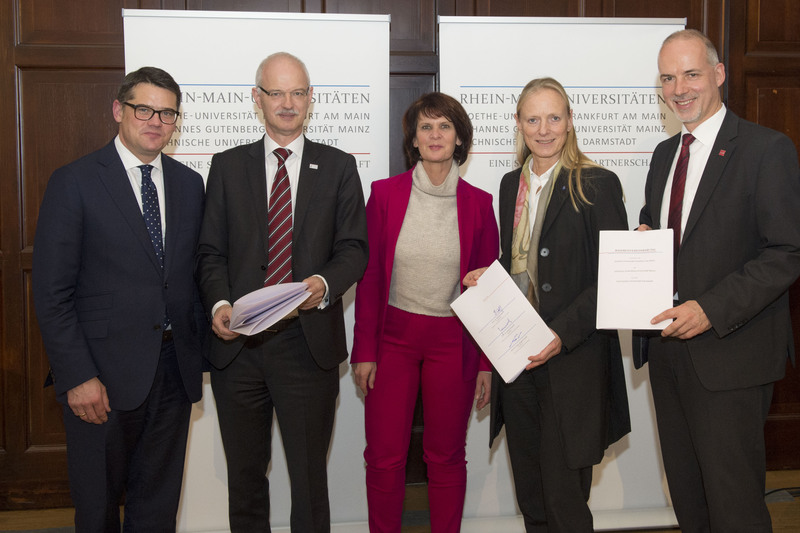 The trilateral agreement will enable the three Rhine-Main Universities to combine their strengths, to jointly develop and specify their complementary profiles, and to extend the opportunities for study available to their students. As centers of scholarship and research, they intend to promote the development of the Rhine-Main region as a knowledge hub and improve its international visibility and attractiveness. The Rhine-Main region with the support of the three Rhine-Main Universities positions itself as a leading center of science and research. According to the most recent Funding Atlas of the German Research Foundation (DFG), the amount of third-party funding acquired in the core academic fields and the total third-party funding obtained by the three Rhine-Main Universities, which amounts to more than EUR 450 million per annum, places the Rhine-Main area among Germany’s top five science regions. Between 2007 and 2013, academics in Darmstadt, Frankfurt, and Mainz received all in all 31 ERC Grants from the European Research Council (ERC), which is the most highly remunerated research funding award in the European Union. Four clusters of excellence, three graduate schools of excellence, and 27 collaborative research centers funded by the German Research Foundation bear witness to the impressive research achievements at the three universities. The close collaboration with altogether 20 research institutes of the Max Planck Society, the Helmholtz Association, the Leibniz Association, the Fraunhofer-Gesellschaft, and different Academies of Sciences and Humanities in the Rhine-Main region play an important role in these achievements. In 2004, the universities in Mainz and Frankfurt signed the initial framework agreement; since then both have entered into bilateral agreements with TU Darmstadt. In more than 70 cooperation projects and discipline-specific collaborations, the three universities have been able to gather an enormous amount of collaboration experience in working together. They share clusters of excellence, collaborative research centers, and joint research projects in the program of the German Academies of Sciences and Humanities as well as joint degree programs and graduate colleges. The collaborating disciplines range from Political Science to Nuclear Physics and from Neurobiology to Computer Science. The topics covered come from the wide spectrum of disciplines at the Rhine-Main Universities – covering Medicine and the Natural Sciences, the Humanities and the Social Sciences to Engineering. The President of TU Darmstadt, Professor Hans Jürgen Prömel, explained: "This is an alliance of partners who already know each other well and who are in tune with each another – internationally renowned research universities in the Rhine-Main region, with a complementary range of subjects and successful collaborative projects. The new Rhine-Main Universities framework agreement opens up many new opportunities to create additional advantages for our researchers and students." TU President Prömel also sees further joint opportunities and potential for the development of promising research fields: "Our Rhine-Main Universities alliance can target major academic challenges by intelligently combining our specific strengths – in Medicine, Engineering, Computer Science, and the Humanities, for example." 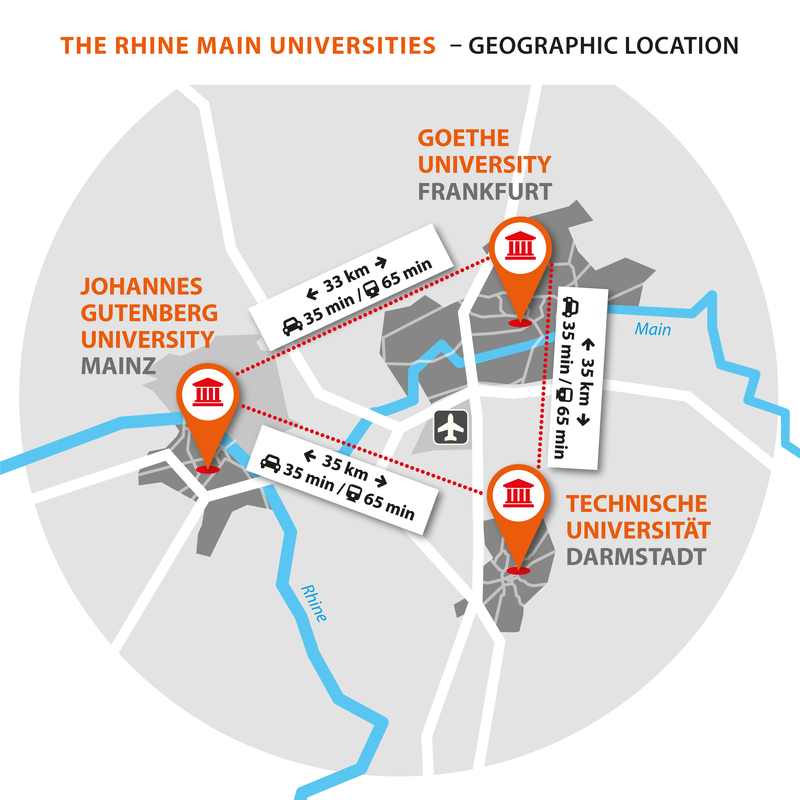 For Professor Georg Krausch, President of Johannes Gutenberg University Mainz (JGU), the location of the Rhine-Main Universities is a decisive advantage. "The strategic partnership of the three universities benefits significantly from the geographic proximity of the university campuses and the non-university research institutions together with the excellent transport infrastructure in the Rhine-Main area. The short distances between the universities can be covered in just 30 minutes by car or commuter rail, facilitating the exchange of knowledge right in the center of an important German metropolitan area – and even across state borders. The geographical situation in the Rhine-Main region is thus at least similar to that in certain large municipalities in which several universities and non-university research institutions may well be located within the same city but in fact are often quite far away from one another." The President of Goethe University Frankfurt, Professor Birgitta Wolff, said: "The three universities can learn a lot from each other and achieve a lot more together than each on their own. We not only have a natural interest in closer collaboration with one another, but also invite potential partners working in research and social institutions to join in project-based collaborations. We will thus be able to significantly build on the strengths of our alliance." Through their trilateral agreement, the universities in Frankfurt, Mainz, and Darmstadt also confirm their intention to apply for support for collaborative research projects and strategic alliances from national and international funding programs. The partner universities also plan to submit joint applications for third party-funded graduate programs and to improve the networking options for young scientists. Students at the three universities will also benefit from the framework agreement. They are invited to use the infrastructure – such as the libraries, for example – at all the universities, while also being able to acquire a part of their qualifications and to sit examinations at one of the partner universities. 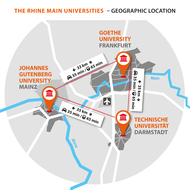 Furthermore, new joint courses of study are currently being planned by the Rhine-Main Universities. Teaching staff at one university will have the opportunity to also teach at the other universities and to act as examiners there. Employees can participate in the continuing education programs offered by all the universities in the alliance. 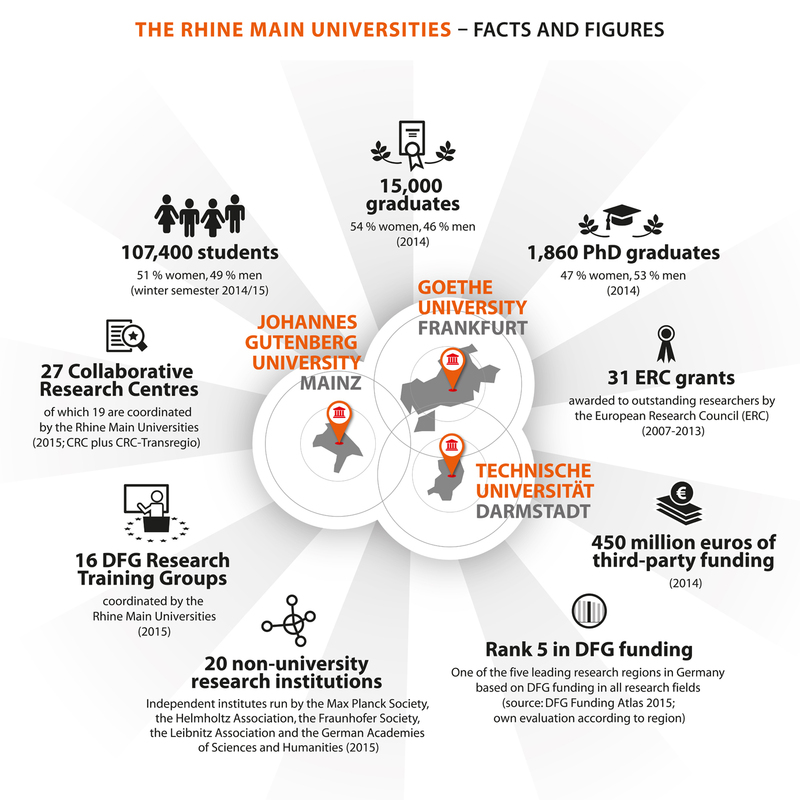 For the support of the strategic development of the Rhine-Main Universities partnership, the presidents have created an initiative fund designed to provide targeted support to new collaborations. At the same time, they are encouraging the faculties and institutions at their universities to develop new fields of potential cooperation.